During the research process for my book I would occasionally find something in the archive that looked unassuming but said so much more. This poster for a reading by Judith Stein and Judy Freespirit, that I found in Freespirit's holdings at the GLBT Historical Society in San Francisco, is one such example. The typography and the images are very straightforward and the yellow paper is eye-catching. I'm not sure of the year, I'm assuming it's the early 1980s, given the Bobbeh Meisehs reference. 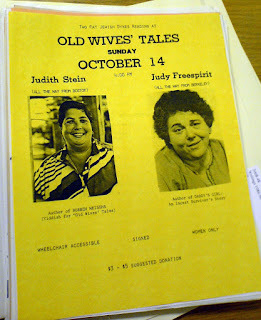 What this poster confirms to me is that Jewish lesbian feminists were important in the development of fat feminism. Radical Jewish feminist community was strong and active at that time in the US, I remember anthologies and conferences taking place. Many prominent early fat feminists were Jewish women. What this means in terms of politics and identity is hard for me to say as someone who is not of that identity, time and place. But I am assuming that better placed people might have insights as to how this affected the politics and range of fat feminism in the early days, for example through radical Jewish traditions of social justice. I imagine that it was important and that there are still many resonances that have not yet been fully acknowledged. There were events by and about fat lesbian feminists which also encompassed other subjects. So here fat lesbian, Jewish, Yiddish and survivor identity was brought to the event as a kind of intersectional lens, in today's social justice parlance. 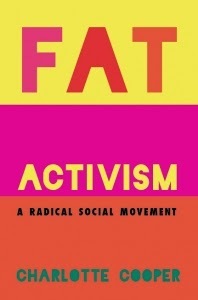 I think this is important because it's a reminder that as activists we don't have to be positioned solely as fat, we can bring many things to the conversation. Fat feminists were creating cross-country alliances at that time and maintaining earlier networks even as they migrated and fractured. I know Freespirit had spent time on the East Coast and was part of fat activist organising there for a while. It's amazing to me that geography and minimal resources did not stop people doing things. Stein's work through Bobbeh Meisehs Press is now super rare and I have seen dealers online trying to sell it for hundreds of dollars. I understand that she created the Press to publish Jewish lesbian feminist material, and that her New Haggadah: A Jewish Lesbian Seder went through a couple of pressings and is held in high esteem by cultural historians. I don't know what happened to Freespirit's Daddy's Girl. I would love to see these documents. It's really good to see access being advocated, not just wheelchair access but signing, and a sliding scale donation suggested. Accessible events often remain an afterthought here in the 21st century. On the other hand, it's women-only, a more contested proposal in terms of who is and who is not granted access, but consistent with the politics of the times. Today one would hope that there would be more sensitivity around gender and access in radical fat feminist community. I get pangs when I see this poster, though I know that this is my nostalgia and that this does not necessarily illuminate much for those who were there. Nevertheless, Stein and Freespirit look full of life and power, as though they have so much to say. I can't help wishing that I could travel back in time and sit in on that reading. I would love to hear these old wives spin a few tales. 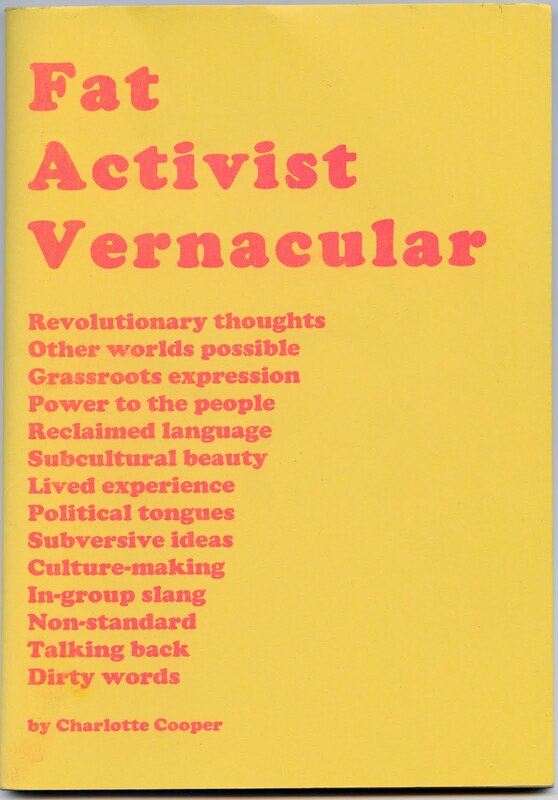 Since I first wrote this post Judith Stein has generously scanned and given permission for me to put her Bobbeh Meisehs online for people to download, read and share. All material is her copyright. Please enjoy them! Can you provide a description of the poster? Sure, it's a sheet of yellow A4 paper, with two black and white images of Judith Stein and Judy Freespirit. There is a small amount of text.